Dr. James Ford and Anna Bunce will we presenting at the Our Common Futures Under Climate Change Conference. 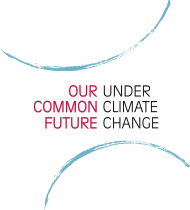 Organized under the umbrella of ICSU, Future Earth, UNESCO and major French research institutions, with the support of the French Government, the Conference will be held ahead of the 21st Conference of the Parties to the UNFCCC, which is planned to take place in Paris later this year. Building on the results of IPCC 5th Assessment Report (AR5), the Conference will address key issues concerning climate change in the broader context of global change. Organized around daily themes, the event will focus on moving from present knowledge to future solutions. For more information, see the list of our team's planned activities below. We reviewed published research on climate change adaptation, vulnerability, and resilience, to identify and characterize the nature and magnitude of the adaptation challenge facing the Arctic. Framing the results using Adger and Barnett’s (2009) ‘reasons for concern about adaptation,’ we demonstrate that: (i) even in the context of >3C warming already documented across the Arctic in the last 30 years, it is not the speed or magnitude of climate change per se that poses a challenge to adaptation, but how climate change interacts with non-climatic factors; (ii) significant barriers are likely to constrain adaptation in absence of concerted action on broader human development deficits in northern regions. These barriers span multiple scales and are linked to long-term trajectories of disempowerment, colonization, and globalization; (iii) the potential for maladaptation is being increased by a weakening of key sources of adaptive capacity, compounded by limited anticipatory actions across scales to prepare for future impacts; and (vi) communities and Indigenous organizations have played leading roles in adaptation decision-making in the North American Arctic and to a lesser extent in the Nordic countries, but in Russia the very nature of climate change as a potential risk is not agreed upon. The challenge of adaptation in the Arctic is thus formidable, yet the review suggests that drivers of vulnerability can be overcome, avoided, or reduced by individual and collective efforts across scales. The last decade has experienced a rapid growth in climate change adaptation, resilience and vulnerability (ARV) research. Concurrently, there is growing recognition that climate change impacts and experiences are gendered, and must be accounted for in research. Yet some have argued that engagement with ‘gender’ has been tokenistic, simply stating that climate change will have differential impacts. It is therefore necessary, given the rapid expansion of literature in this field, to critically analyze the framing of concepts of gender within the literature. In order to determine how meaningfully gender is being addressed in ARV research, we created a conceptual model capturing key components of ‘meaningfulness.’ Meaningfulness is ascribed as being a function of gender mainstreaming, the experience of gender, and the degree of action being taken. Using a systematic literature review methodology, 123 peer reviewed ARV articles with a gender focus were analyzed. While 41% of analyzed articles were found to have high levels of meaningfulness, significant variations across regions and disciplines emerged. Research occurring in Sub-Saharan Africa was found to consistently engage with gender in a highly meaningful manner. Although a great deal of gender focused ARV research is occurring in Bangladesh and Australia, overall these nations exhibited low levels of meaningfulness. Health, environmental management, and hazards research emerged as disciplines engaging with gender in the most meaningful manner, although areas needing improvement became apparent. Gender focused work in this field focuses almost exclusively on women, with very little research examining male experiences and no work accounting for those identifying outside the gender binary. While meaningful work is occurring, 31% of the surveyed research was found to have low levels of meaningfulness, demonstrating a need to highlight meaningful methods to reconcile climate change and gender. This conceptual model provides a baseline understanding of how ARV research is integrating concepts of gender into their work which researchers can use to ensure more meaningful engagement with gender in future research.